For floor cleaning, iVision has developed a specific kit with a fixed brush positioned on the front part of the vacuum with a handle for manuevering. For those that need a continuous work cycle in construction environments and need to empty without interrupting work due to turning off the vacuum to empty the collection container, the iVision rotary valve kit is an interesting solution. The cleaning kit, usable through the IV3 series, consists of a robust, anti-abrasion tube that ends at the extremities with special zinc-plated steel accessories capable of transporting, without any obstacle, chippings and oil from the machine tool to the vacuum collection tank. The suction tube comes housed inside a support in order to facilitate the movement of the vacuum in the workshop without being an obstable for the operator, it allows the avoidance of leakage of oil during the maneuvers of the vacuum. The gate valves that enable the closure of multiple vents allow the operator to choose to work with one, two or more hoses simultaneously. These gates can be operated manually by operators, handled automatically by machines, or remotely via foot pedal. Metallic mesh chips separator from lubrication. This optional accessory allows you to perfectly separate aspirated solid materials from liquid, to facilitate their storage and/or disposal. The chip separator holds the solid material allowing the liquid to deposit to the bottom of the collection tank. 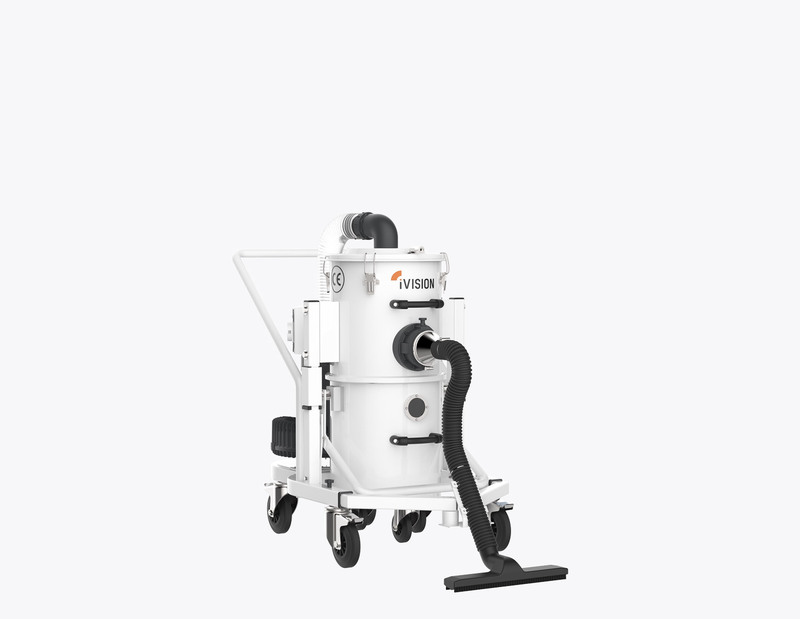 iVision Vacuum is a point of reference in the sector of industrial cleaning and heavy industrial collection.